EOS, who hasn't heard of the brand before? I thought I went crazy when I bought 3 eos lip balms at once. You can't blame me, they just look freakishly darn cute! :) But then I saw beauty guru's buying 4 or 5 at the same time. Somehow it gave me peace of mind. The second I tried my first one, I regretted I didn't buy the other ones... So I went online to get myself some other eos goodies. So let's hydrate those lips and hands and get typing! As you can see I have 5 of the 7 lip balms: there's summer fruit (red), lemon drop spf 15 (yellow), strawberry sorbet (pink), honeysuckle honeydew (green), medicated tangerine (orange), sweet mint (blue) and LE passion fruit (purple). It says they moisture your lips, and I think that they do but unfortunately not for long. You have to keep re-applying the balm. I have to admit that I bought these because I had a weak moment. Sometimes, just sometimes, I can be a real sucker for packaging! :) The thing about this lip balm that it has a twist-off top. Cute? Yes! Convenient? Not really... If you accidentally put the cap on too fast without looking you can dent the lip balm itself, shoot! But on the bright side, they do moisture as soon as you put some on! Other good things to mention? They're paraben and petrolatum free! Their advice? Twist off top. Pucker up. Smooth on. Smile. Then we have our hand lotion. Let me sum up this lotion in one word: incredible! There are 3 different scents: original, cucumber and berry smoothie. They're for all skin types, smell great, hypoallergenic, moisture, fast absorbing and just fab! No cons for this baby! I'm sure I'll be repurchasing this as soon as I'm finished with my berry blossom. Their advice? Smooth on. Touch. Smile. 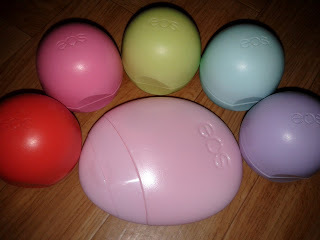 I have heard great things about these eos products and i certainly don't blame you for caving at the packaging..sooo nice! !